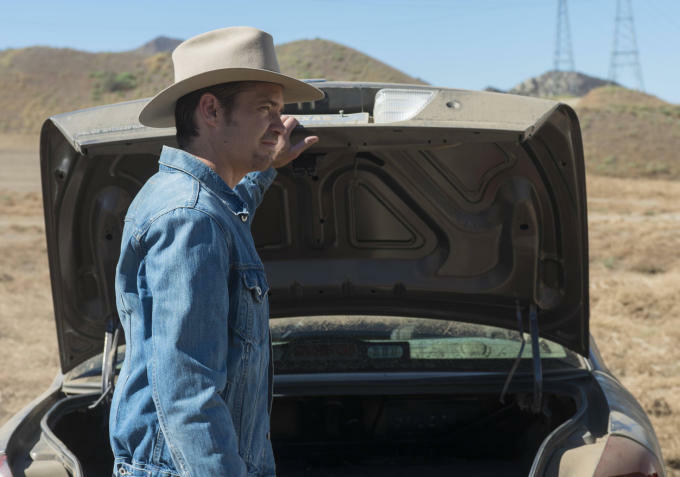 If last night’s episode was any indication, this final season of “Justified” is going to make for a great Whiskey Watch: “Bourbon” was the first word uttered by Raylan Givens. Because he happened to be in a bar in Mexico, however, all that order got him was an “Are you kidding?” eyebrow lift from the bartender and a pour of tequila. Ava, meanwhile, was having vodka for breakfast – and not even good vodka (if there is such a thing). Having agreed to provide information that Raylan needs to send Boyd away for good, she needed to calm her nerves around her increasingly suspicious lover. Following a commercial for Maker’s 46, we saw Raylan bring a present – a bottle of Blanton’s bourbon – to Art, who is still recuperating from being shot last season. “I don’t suppose that is doctor-recommended,” Art observed wryly. “Civil War doctor, maybe,” Raylan replied. Boyd sent his trusted associate, Carl, to fetch two glasses. But we’ll never know what he would have poured. Unlike Dewey, Boyd knows that there is no returning to the past. Furthermore, he knows that there is no future in Harlan, and that he can’t trust Dewey anymore. In a scene reminiscent of Carol’s “Look at the flowers” speech in The Walking Dead, Boyd directed Dewey to look at a faded photo of his grandfather and his fellow coal miners, then dispatched him. I suppose you could say that while Dewey didn’t get his drink, he did get a shot. I wanted to know what Bourbon Art and Raylan were dtinking, and boom! Here it was. Thanks! Just finally catching the final season now that Amazon knocked the extra money off and am intrigued by what brand they’re drinking in that episode….